Waking up at 11:40 a.m. Raw Cacao Protein Shake with Blueberries, Banana, and Almond Milk. Getting business take care of. Bank. Dropping off recycle. Grilled PB&J Toast with Bee Pollen. Olive Oil Potato Chips. Honey Green Tea. Milk Chocolate with Hazelnut. Ana and I hit the road to Richmond as soon as I finish my last lesson. We've got to make the Sufjan Stevens concert. Sufjan was a very important musician for me back in my younger years of music making. I made dinner earlier in the day and packed it in Tupperware containers: Black Eyed Peas with Basmati Rice, Kale, and Carrots. Meeting up with Josiah and Bianca on the third tier of the Altria Theater. 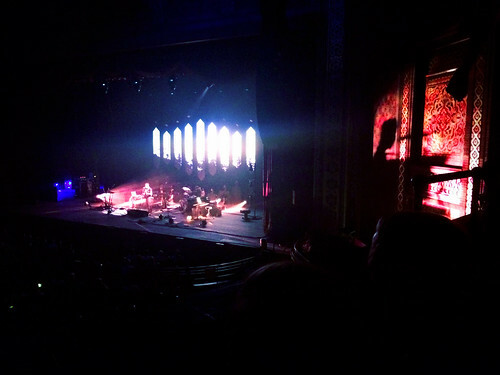 It's a grand music hall – huge – the perfect location for an artist like Sufjan. I'm not sure how else to describe the experience in words but it's a perfect performance. His voice sounds just as pure and wispy as it does on record. There are moments when the band takes an ethereal run off from the songs – it's powerful. Afterwards, as everybody is piling out of the theater, we notice other familiar faces from the 757. Ana and I chill with Josiah and Bianca at our friend Shane's place off Grace. Discovering a hidden late night cookie place in an alley called Red Eye. They even deliver till 1 a.m. Ana and I grab a couple Chocolate Chip Cookies to go. 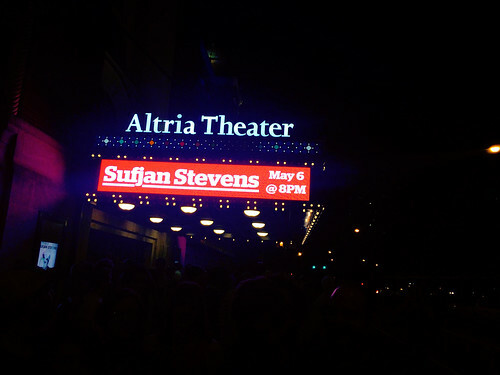 On the drive back talking with Ana in the car and reflecting on the concert, "As I was sitting there in that grand theater with all those people just watching and listening to Sufjan perform I felt an overwhelming sense of love. It was inspiring." She brings to mind a Beethoven quote, "Music is a higher revelation...than all wisdom and philosophy." Back home. Settling in. Kevin's got a girl over. Before they head upstairs after smoking cigarettes out back he bothers me in the kitchen. "I'm making almond milk! I have to do it now so I can have it in the morning!" "He's making almond milk at three in the morning," he scoffs.